If you are searching for a party bus in Farmington, then rest assured that your search has indeed come to an end. Here at Rockstarz Limousine and Party Bus, we specialize in providing our clients with the perfect location for their celebrations, no matter what the occasion may be. To rent a party bus, you will clearly want to also make sure that you are aware of how many guests can be invited along to your party. Thanks to our layout of our party bus, we have made sure that you are now able to invite along even more guests than ever before resulting in more people having an amazing time on board. 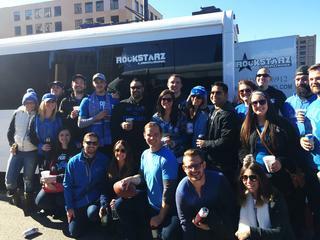 Our Farmington party bus rental service is also designed to provide you with the sense of being in your own private nightclub as you cruise around the city. To help, we have made certain that the interior is able to offer you an amazing atmosphere from start to finish including a state of the art stereo sound system that will just blast your music throughout the bus. Throw in a stunning laser light show, and you ultimately have the perfect location for a party. In the past, people have used our Farmington party bus service to help them to celebrate a number of different special occasions. From birthdays, to anniversaries, other celebrations, and even bachelor and bachelorette parties, we have it all covered. Also, perhaps just you and your friends are looking for a party location for no special reason, if so then we can still help to provide you all with an amazing experience. So, if you do live in the Farmington area and are looking for a party bus, then give us a call here at Rockstarz Limousine and Party Bus. Alternatively, you can contact us via our website and a member of our team will be in touch as soon as possible.